I believe my style is more like Impressionist than anything else though I never really decided intentionally to work in any specific "style". It just kind of developed out of my interest in the work of Cezanne, Renoir and Monet among others. 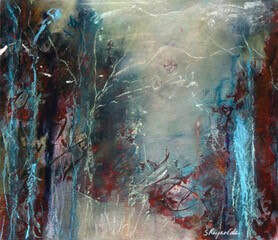 My media is mostly pastel though I love mixed media too using pencil, pen & ink, watercolor and pastel. 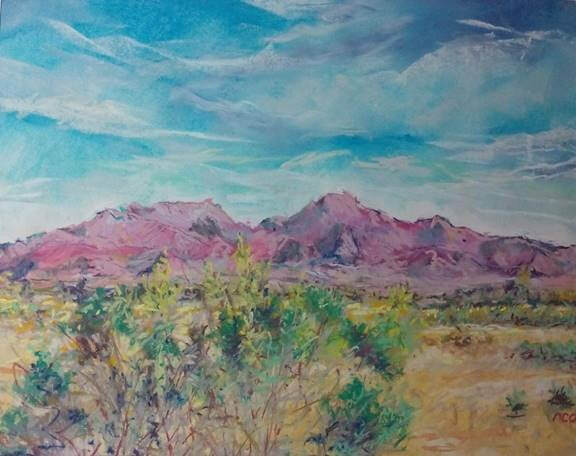 I paint landscapes because I love nature and want to show others the beauty of our desert lands and skies. I paint still-life choosing objects that work together to tell a story or convey an idea of what the person those objects belong to must be like. I was born an army brat. With my mother, brother and sister we followed my father around the world from Army Base to Army Base. Never really belonging anywhere I didn't try to make many friends so drawing was how I entertained myself. When I was young drawing horses was one of my favorite pass times. Because we traveled a lot I can honestly say that nature has always fascinated me. I've never been anywhere that I couldn't find something to love about it. I married young and raised two daughters in Austin, TX working first in data entry and later as a bookkeeper and administrative assistant. Once the girls were out on their own and I was no longer married I spent some years following another passion of mine as a Psychic and Tarot Reader. I lived in an RV and followed the fair circuit around the western US doing Psychic Fairs and Renaissance Festivals, where I picked up a talent in belly dancing as well as being the Gypsy Fortune teller. I traveled north in the summer and come back south in the winter. 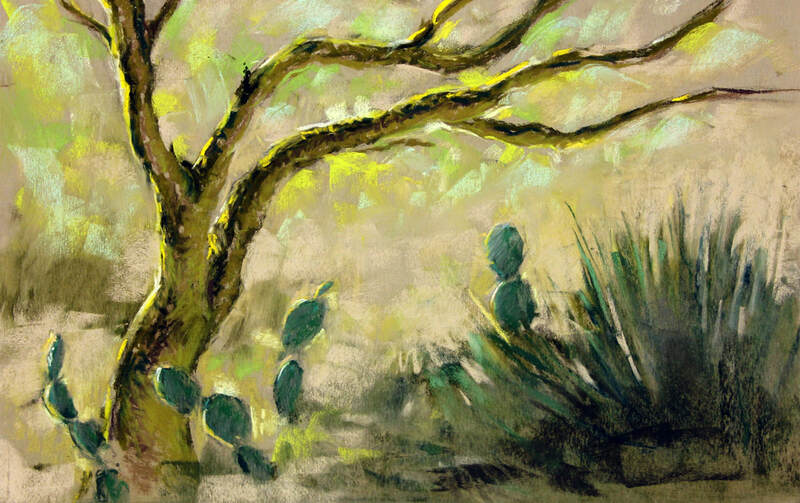 Each time I came through Arizona I stopped at a camp ground in southern Tucson and fell in love with the sunsets and sunrises and the beauties of the desert all over again so that after a few years when I came back to Tucson and saw the sunsets I felt like I was home. ​So when one of my daughters called to tell me she had a job in Tucson and wanted me to come help her settle in I dropped everything and settled in here myself. Long story short, my daughter is back in Austin but I'm still here in Tucson. I started drawing as a child. My favorite subject in school was Art but life got in the way. Now I have the time and so I create my artwork because I want to. It quiets my mind like transcendental meditation and lets me enter a world of my own. Some of my other interests are drumming with local groups like the Desert Crones and playing the Didjorie Doo which is an Australian Aborigine type horn made of a hollowed out log, though all of mine are made of agave. 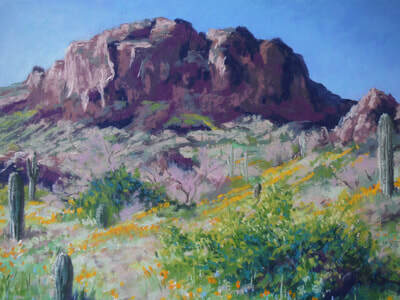 Now as a member of the Tucson Pastel Society I am becoming more involved in the local art scene and loving it. I plan to spend the rest of my life recording the beauty and adventure of the world around me as an Artist. I am interested in the ongoing and evolving relationship plants have with people and how to portray their fascinating appearances in a vase, in a garden, or in the wild. I come from gardening stock. Both my grandmother and my mother loved to garden and they inspired my interest in plants. They also nurtured my enthusiasm for art. I know that domestic plants and their wild relatives make life on earth possible and for me they are worthy subjects for artistic expression. 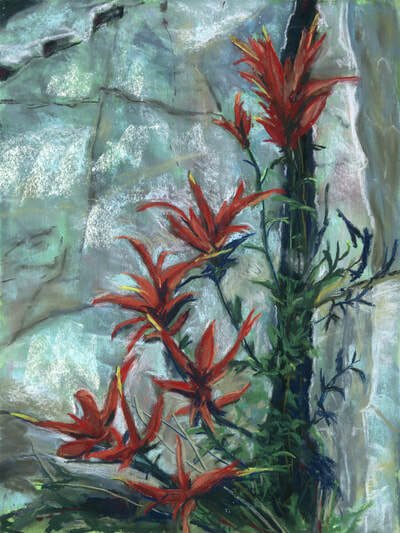 Plants provide us with food, clothing, medication and shelter and I like painting them for their bold or delicate structures and their rainbow colors as well as the remarkable places they inhabit. My botanical illustration background taught me to slow down and take a long look in order to record what I saw. 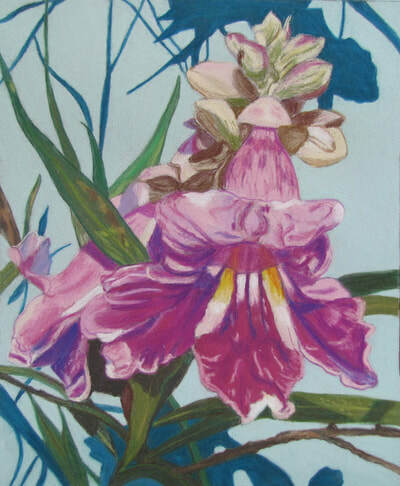 The practice of drawing to know the plants in my garden became a passion and a lifelong pursuit. It brings me endless hours of satisfaction and informs all of my artistic choices from botanical illustration to painting in pastels. 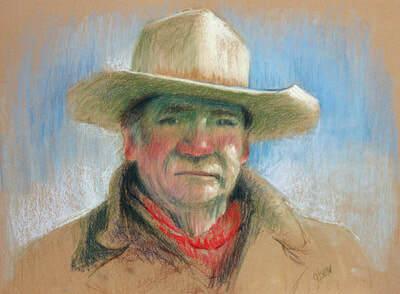 Pastels are a hands-on medium and the perfect choice for any artist who likes to dig in the dirt. 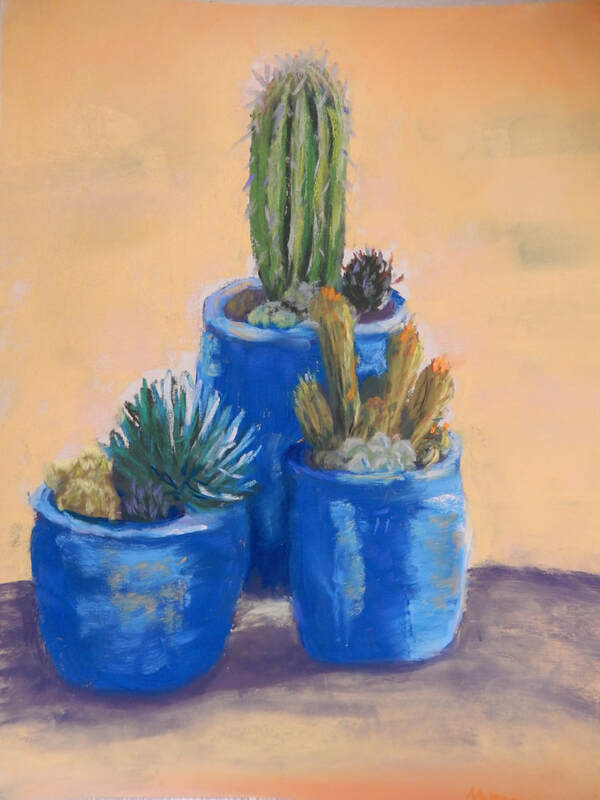 They are both messy and gratifying much like gardening and I find they are a gritty colorful way to paint my own connection to plants. 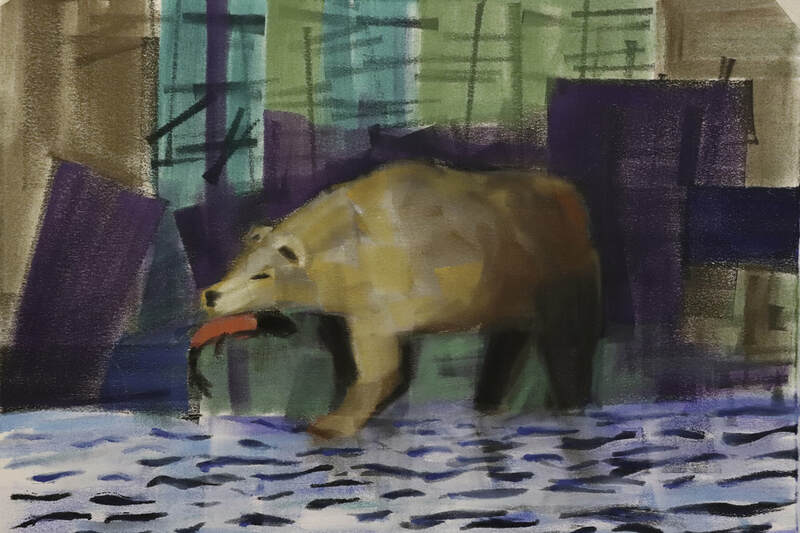 Nancy was a doodler from an early age growing up along the Rocky Mountains of Colorado where her awareness and curiosity drew her to enjoying nature. She also loved to finger paint and create “masterpieces” with crayons. Later her mother taught her to paint using Japanese techniques as well as sending her to art classes. Robert Bateman and Steve Hanks fascinating and beautiful. She continued her love of drawing and art as a hobby. However, her career was in Science Education where she worked with middle schoolers imparting her love of the natural world. Nancy has traveled with her husband, Jim, to many locations including Africa, Japan, Central and South America and Europe where she experienced the beauty and culture of many environments and civilizations. appreciate the grandeur of nature through her use of color, light and value in her painting. Nancy currently lives in Green Valley, Arizona creating works in pastel, oil, watercolor and graphite. 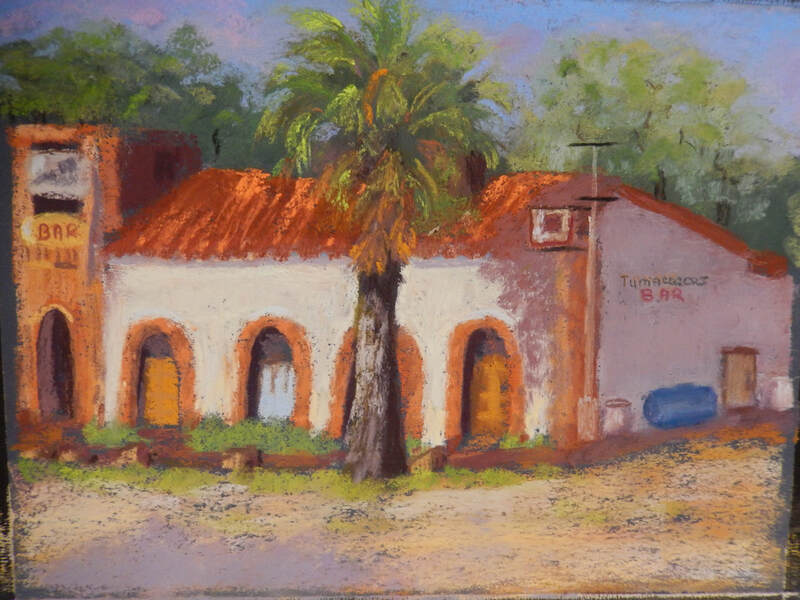 In addition to her membership in TPS, Nancy is the current President of Santa Rita Art League in Green Valley. My lifelong love of travel and the beauty of nature has fit well with my interest in painting that developed after I retired. 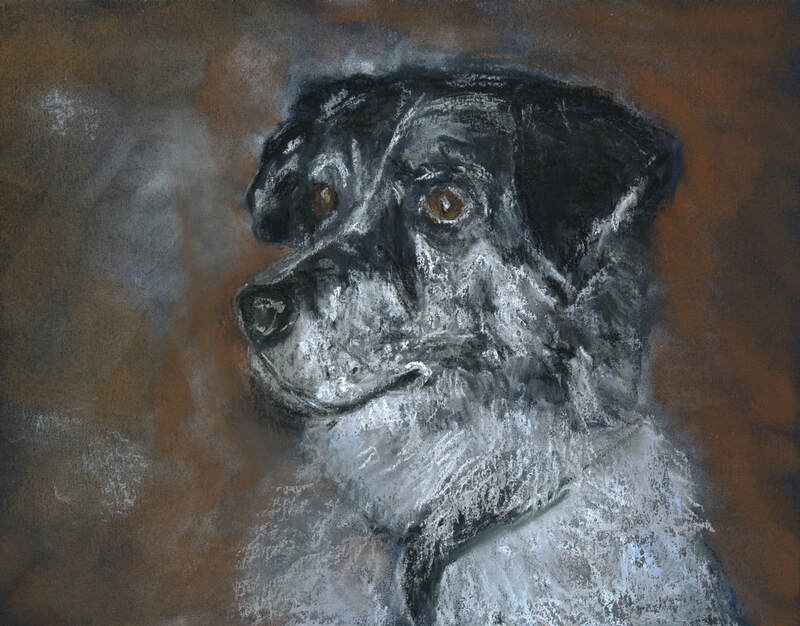 I had dabbled a little in art work and oils years ago but didn’t keep at it. We lived most of our life in the Redwood Empire and the wild northern Pacific Coast before moving to the Sonoran Desert twenty-four years ago. In Tucson I registered for an OASIS adult education class in pastels in 2005 and enjoyed it. 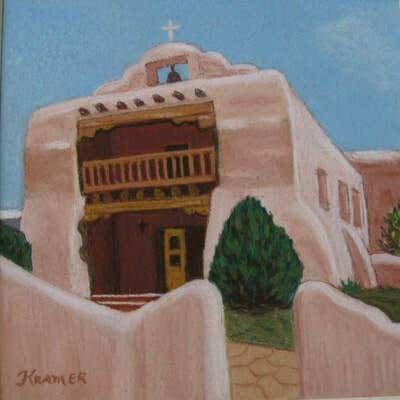 (Cheryl Bullard was in that class which was taught by artists Peg Allen and the late Dale Allen.) I kept on weekly for five years when the class ended. I love the vivid colors of pastels and the many choices of papers and sticks—lots to experiment with! Fortunately I found the Tucson Pastel Society starting to hold meetings at the Jewish Community Center. As an amateur hobbyist I use my photos as reference. 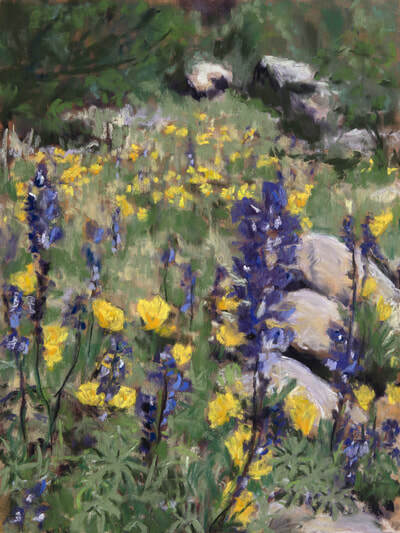 Since my husband had worked as a naturalist I was used to looking at flora and fauna in great detail—something of a hindrance for trying to be impressionistic. 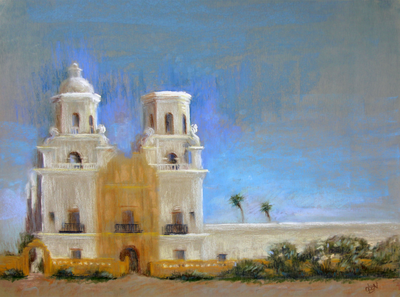 Landscapes and flowers are my favorite subjects and I enjoy painting old buildings and historic sites as well. 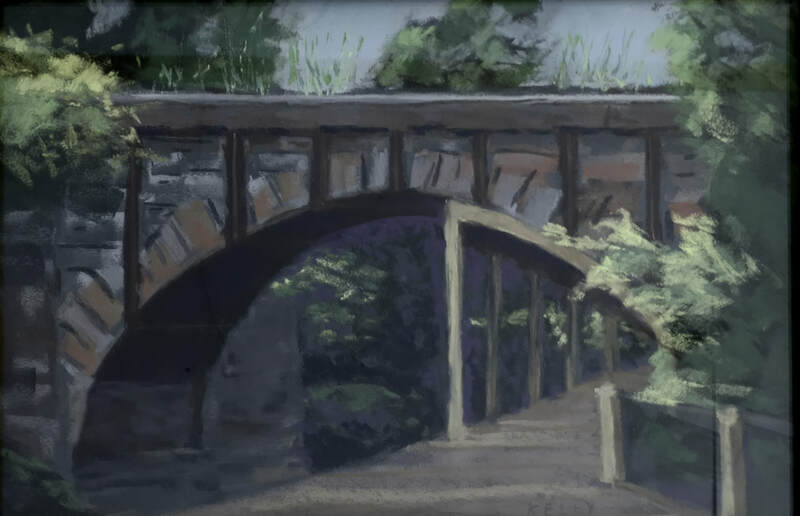 Taking a plein air class with Meredith trained me to speed up and paint on site to “catch the light”. But I need to practice more and more and forgo other hobbies and interests. 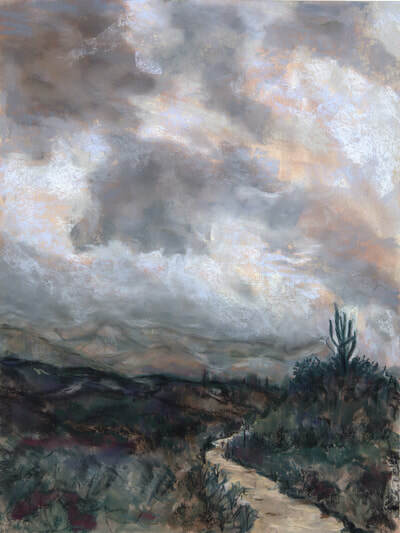 We enjoy driving to Albuquerque to attend the IAPS conference every other year, meeting artists from all over the world, seeing their works, and taking classes. The TPS has been a treasure trove of information and opportunity for us artists and has been an impetus for me to continue painting and try to improve my ability. I am a plein air painter whose favorite subjects are old farms and rural landscapes. I show my work in paintouts all over my home state of Michigan. 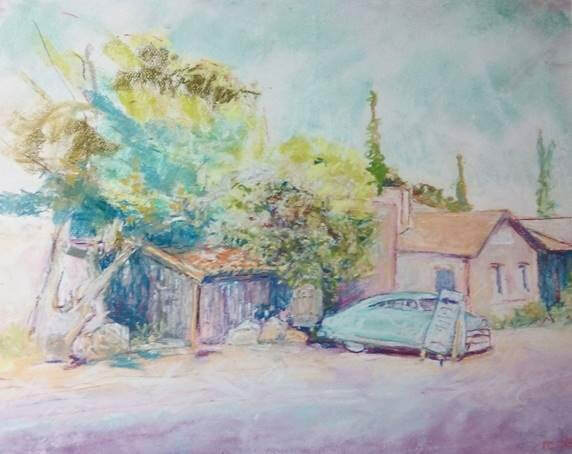 I am represented by the Glen Lake Artists Gallery in Glen Arbor, Michigan and the Stonehedge Gallery in Elk Rapids, Michigan. My aspiration is to capture the landscape as it relates to people. As a former biology teacher, I encouraged my students to personally engage with their natural surroundings. 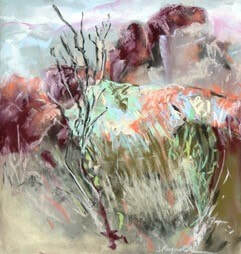 This experience enabled me to better understand how people relate to the landscape which I capture in my paintings. paintings are done on site, in the plein air fashion. My technique starts with looking for interesting patterns of light, making a quick pencil sketch and taking digital photographs for future reference. 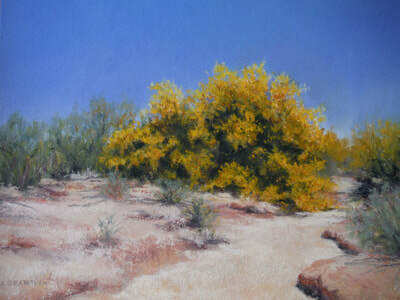 my artistic skills by taking numerous workshops from artists such as Richard McKinley. 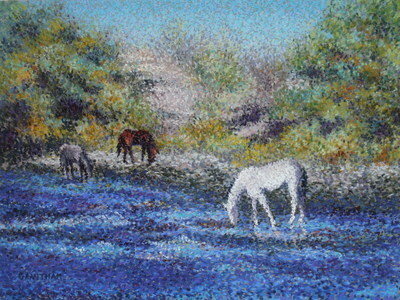 I was born in Memphis, Tennessee as a third generation painter. Growing up, I played under my mother’s easel and developed a love for drawing. My mother was a portrait painter, my aunt was a landscape painter and my grandmother was a porcelain painter who designed and painted china patterns. 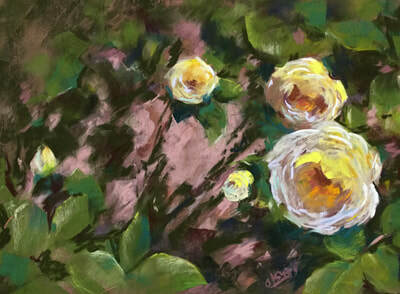 My artistic training developed through formal education, intense practice at the easel, experimentation and tutelage under several new masters. ​ At a time when representational art was not offered in the fine arts curriculum of most universities, I chose to earn a Bachelor's of Art (B.A.) degree in Art History by studying the Old Masters via the classroom instead. My earliest professional drawing experience consisted of technical and architectural blueprints, prior to computer aided design software. 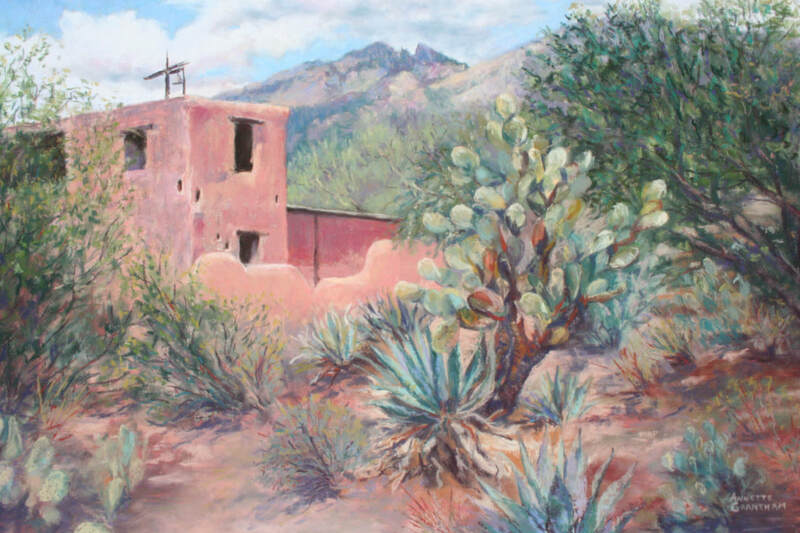 However my artistic drawing skills were honed via The Drawing Studio (TDS) in Tucson, Arizona and I eventually started teaching myself. I also continued my studio art education through professional workshops and I studied privately under several contemporary artists including Dawn Emerson, Suchitra Bhosle and Stephanie Birdsall. 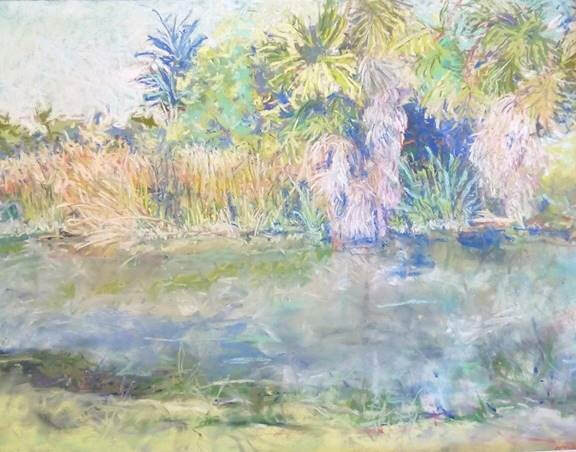 ​My work has been exhibited in multiple selected solo shows, galleries and group shows across the United States. However today I really just enjoy teaching art with the Art Verve Academy. I have had a lifelong appreciation for nature. As a child, I spent all of my free time building forts outside, riding bikes, and climbing trees. I would constantly bring home nature’s tokens: pinecones, shells, seedpods, and rocks (LOTS of rocks). When I couldn’t be out of doors I was drawing pictures of it. As a teen, I spent even more time drawing and learning to see. But we all have to grow up, and once I was married art necessarily took a backseat. My family grew, and I did not have much time for drawing. But we did spend lots of family time outdoors playing and camping. My five children developed a reverence for nature and learned to be good stewards of the earth. I shared what I knew about wildlife, plants…and rocks. Finally, with my youngest child in high school, I found my way back to art. I started with the basics, waking up those dormant brain cells with graphite exercises. When I felt comfortable again, I tried my hand at colored pencil. Having done some watercolor in college, my return to this was very satisfying. But when I saw a friend working in pastel---wow! I was awakened to its luminosity like Dorothy stepping into OZ! A pastel love affair ensued. With its velvety texture and resplendent color, I was hooked! Pastel is heady and exciting! Pastel is vivid and fresh. Pastel can appear as substantial as oil paint, but there is no dry time. I connect with the color like it’s coming right from my fingertips. I believe I have found the perfect medium to express my deep-seated love of the landscape. 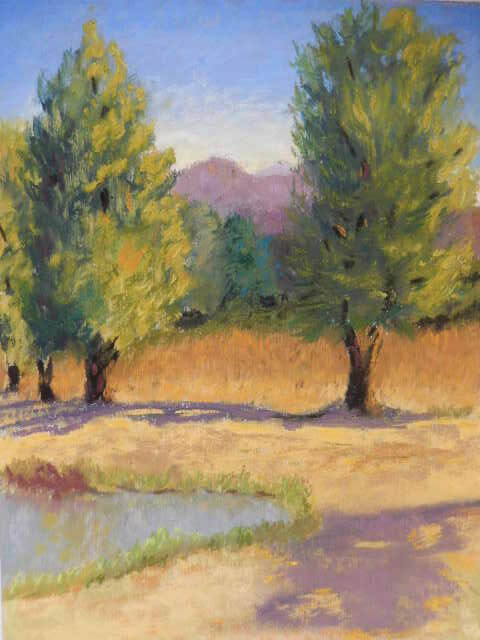 Nature, in its variety, is a constant source of inspiration and now I share my joy through my pastels. Working in pastel has opened many new opportunities. I have been honored to have my artwork included in several TPS shows as well as exhibitions for the Empire Ranch Foundation and the current show, Puma: Past and Present at the Arizona Sonora Desert Museum. Art and design have always been an interest and passion for me. I have had some basic training in drawing, painting, and design, in schools I have attended. My interest is in landscapes and portraits. My mediums are pastels, acrylics, and oils. I worked in oils for 35 years doing high-end custom furniture finishing and refinishing, working with designers and custom builders on custom homes. The last 10 years I designed, built, and finished custom cabinets for custom homes. I grew up in the Middle West until my father decided to become a farmer and we moved to an apple orchard in Pennsylvania. I was an artist from a very early age and my family saw to it that I had classes while in elementary school at the local museum. I took more classes in college but when I became immersed in my career as an academic librarian, I stopped drawing. 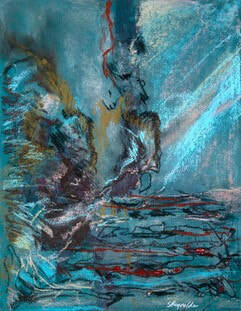 My younger sister became the serious artist and an art conservator, and I stepped back and enjoyed her work. 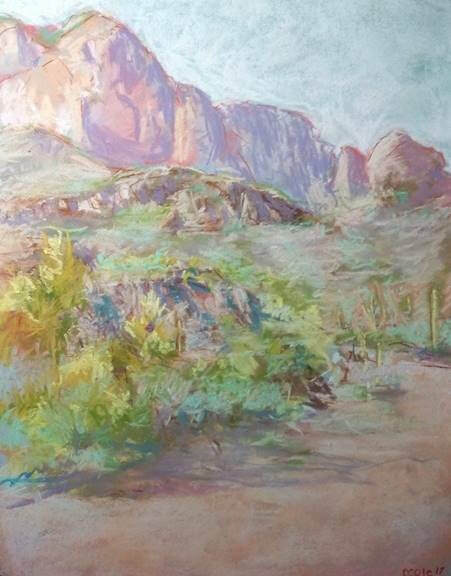 Because I was lucky enough to end up in Tucson, I had new opportunities to rediscover my love of drawing through the Art Institute at the Desert Museum and then the Drawing Studio. I tried color pencils, water color and oils but pastel came out on top. I love to draw and I consider pastel the ultimate drawing experience.